Maritime Accidents | Eduardo De La Cruz-Munoz P.A. Pursuing legal action for a boating accident may be difficult, especially in Florida, due to the various international, federal, and state maritime laws. As such, it is important to hire an attorney who has significant experience and extensive knowledge of the myriad of laws involved. If you or a loved one has been seriously injured during a boating accident and you wish to pursue a claim, contact the Law Office of Eduardo de la Cruz Muñoz, P.A., where we are committed to obtaining full compensation for your pain and suffering, as well as any other damages relating to the accident. Negligence- If the operator of a boat acted in a careless or thoughtless manner that caused death or harm to an individual, they may be held liable in a negligence claim. 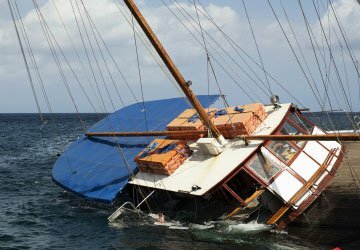 Types of negligence claims include but are not limited to excessive speed, operating a boat in dangerous weather, failure to have proper or sufficient safety equipment, colliding with another boat or object, operating an overcrowded or overloaded boat, and failing to abide by FFWCC rules. Boating under the influence- It is illegal to operate a vessel under the influence of drugs or alcohol. If the operator was under the influence at the time of the accident, you may have a strong case. Reckless operation- Individuals must operate their boats in a reasonable and safe manner with regard for other vessels, posted restrictions, dive flags and other circumstances. If the other party failed to observe and abide by these regulations, you may have grounds for a lawsuit. Cruise ships are required to exercise the highest level of care to make sure their passengers are safe and protected from harm. If they fail to exercise due care and passenger injury occurs, they may be financially responsible for the damages. If you or a loved one has sustained an injury while on board a cruise ship, you may be able to file a claim against numerous possible defendants including the cruise line or company chartering the cruise ship, the company that sold the cruise ticket, and/or any third party that caused the injury. There are many different types of injuries that can occur on a cruise ship, which can include but are not limited to slip and falls, food poisoning, sexual and physical assault, pool and water slide accidents, injuries during recreational activities, injuries caused by crew error or negligence, and wrongful death. They often small print on the passenger ticket controls many important aspects of filing a claim such as, where the claim must be filed and within what timeframe it must be presented. The ticket is actually a contract between the passenger and the cruise line. At the Law Office of Eduardo de la Cruz-Muñoz, we are dedicated to timely filing claims against cruise lines, ensuring our clients receive the just compensation they deserve for their losses.